Sheri is also looking for this same bear. I am looking for a Carter’s teddy bear. It is a light brown/tan color. 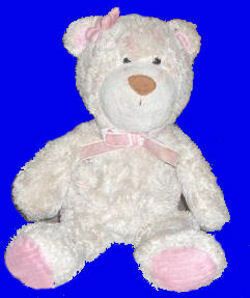 The bear has a pink bow around the neck and a pink (plush) flower by the one ear. Please tell me you have it! If you can help Jenn find this Carter’s Tan Teddy Bear with Flower, THIS SITE IS NO LONGER ACTIVELY MANAGED. Please use Our FREE FACEBOOK GROUP, including #041208-4 in the subject, .